Morris Investigations specializes in difficult surveillances. Each investigator has all the latest high tech video equipment and digital still cameras with long lenses available at all times. Surveillances can be arranged to meet your needs and produce the results you require. Assignments have come directly from Firemans Fund, Liberty Mutual, Nationwide, State Farm, Farmers, American Century and many others. There is a four (4) hour minimum charge for all surveillance assignments. Important things you need know about starting a Domestic Surveillance. It is extremely important that you give your investigator the complete facts. Inaccurate information will not help your effort, but will more than likely hinder it. It will possibly cost you money. Investigations delayed or extended because the client gave inaccurate information are not the fault of the investigator. Billing time and mileage start from the time the investigator gets in his vehicle and starts driving to the surveillance start point. Billing ends when the investigator returns. Surveillances that don't have an accurate starting point or a positive position on the subject are rarely successful and are generally more expensive. This is the reason we leave the starting place and time up to the client. It is likely we will help develop a Plan B if there proves to be difficulty locating the subject. You will be asked to provide us with photos of the subject. We need a close up of the subject's face, with a current hairstyle if possible. A full body shot also helps. We need to know if the subject is short, tall, thick, thin, etc. We may have to pick the subject out of a group of people and it can be difficult if we don't know what he or she looks like. We need as much information as possible on the subject's vehicle. The license plate number is best, but we can use make, model, color or any other unique decals, dents, bumper stickers that might be visible on the vehicle. The Client must always be truthful with this office. If at any time, it is discovered that the Client has not been truthful about the facts leading up to an investigation, the investigation can be terminated immediately. By creating a RETAINER, the Client agrees that if this rule is broken, the investigation stops immediately and the remainder of the retainer could be forfeited. There will be no deviation from this policy. The Client must fully understand and agree that at NO TIME will the Client or a Representative show up at any surveillance location during times at which surveillance is being conducted, nor will they contact the Subject of the investigation or let the Subject of the investigation know that he or she is under investigation. Doing so would place the investigation in jeopardy and could compromise the safety of the investigator(s). By creating a RETAINER, the Client agrees that if this rule is broken, the investigation stops immediately and the remainder of the retainer could be forfeited. There will be no deviation from this policy. 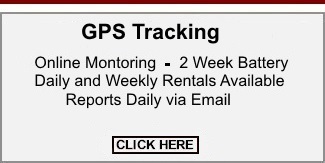 GPS Tracking Available. For usage restrictions and details, please call the office at 281-358-1151.